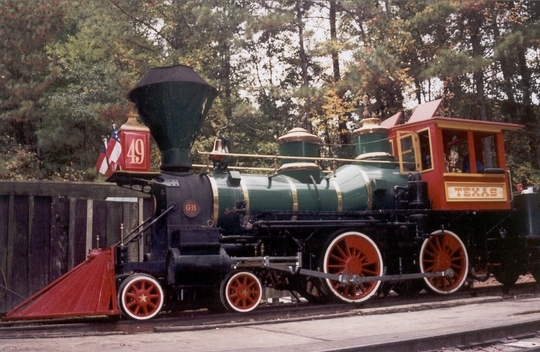 Older photo of a Harpur-built (1960s) 36" gauge 4-4-0 at Six Flags park, Atlanta. I think these were built using the same patterns as the two Disneyland 4-4-0s. Scuttlebutt on the Park Trains list indicates the engine is now out of service and might become available. Good engine for the Stuhr Museum in Nebraska? Actually, I took that photo in the summer of 2000. We had just made a dry run and cleaned the engine (steam cleaned the running gear, shined the brass, waxed the boiler jacket). Sadly, the engine is now just another victim of the bean counters. I plan to add to more photos from SFOG to that "Webshots" album over the next couple of days. Bob Harpur designed and built 4 of these for Limited Partners Inc. (a Penn Central Subsid). 2 went to SFOG and 2 went to Astroworld in Houston, TX. G-H only ever finished the 2 for SFOG. The Astroworld locomotives were completed after shipping as pieces to Houston when G-H folded. They are sweet little locomotives and I would hope they find a nice home. I second Randy's sentiment. They were fun to work on, fun to fire and fun to run (what little of that I did!). Considering they ran for about 36 years, I think they were fine locomotives, and I wish I could afford to give at least one of them a home. > they find a nice home. Post subject: No Past Tense Please! I hope they will again steam somewhere. BTW, James Caldwell, a fine SFOG Locomotive Engineer, as well as a revered SR Hogger passed on to the great roundhouse in the sky this morning. He will will be missed as will the fun times we all had over the years at SFOG. > give at least one of them a home. A rep from Over Georgia says that "steam is dead", the locomotives are dangerous to operate as they are in bad shape (send them to Tweetsie and get them restored!) so they want to convert them to diesel. Its really just to cut costs, if they convert them to propane or oil they will be easier to run, and if they took better care of them and got them restored it wouldn't be a problem. They didn't even have (recently) lettering on them because the park was too cheap about the railroad! They are running a hideous steam outline converted from a Henschel I believe named "Gretta", its an 0-4-0 and is ripping up the tracks. It has an *airhorn* mounted to the cab roof. Six Flags just can't keep up with Cedar Fair when it comes to railroads (and I won't say Disney because they have talked about converting to diesel and are ordering diesels for their new Hong Kong park). The steamers were damaged when being moved outside. This guy Odum makes no sense, he says the steamers will not be left to rot but might be put on display outside. That sounds like rotting to me. No need to go to Tweetsie, we can do it right here. Consider training to operate steam and how it relates to the minimum wage semiliterate part time barely pass the drug test labor hired as ride operators by most parks. Yeah, simple hydraulic drive units make sense from the managements POV, but it would be a shame to see the steamers rust away. They're not in that bad a shape. The General got a new firebox, new axles, and new valve gear in the late 90's. It has a leaking boiler tube that put it out of service. Looking inside the washout holes, the rest of the tubes look to be in good shape to me. The Texas' boiler needs some work, but they haven't taken the jacket off or done anything to give them the idea that it needs "massive" amounts of work to steam again. Fortunately the locomotives are owned by Limited Partners (same folks that own the land the park is built on), not Six Flags. They have apparently stated that the engines can't be gutted. So the plan is to buy all new tenders with the diesel hydraulic apparatus inside. Word around the campfire is that the steamers were put outside to rot to try and force the hand of Limited Partners.